Roger Hardy finds himself caught up in an unprecedented protest in the conservative kingdom of Saudi Arabia. It was a situation journalists sometimes find themselves in - you are suddenly in the middle of something unexpected, and you haven't the faintest idea what it is. I was trying to leave the capital Riyadh and catch a flight to Jeddah, but the car from the Ministry of Information got caught up in more than usually heavy traffic. As I looked out of the car window, it gradually dawned on me that something odd was happening. There were police everywhere - and groups of sullen-looking young men. I watched them pick up a piece of wood and fling it into the road in front of a car that, like mine, was stuck in the traffic. It seemed like a small and futile act of defiance. But defiance of what - and why? By now, the driver from the ministry was looking uncomfortable and glancing anxiously at his watch. At this rate we would miss the plane. After he had struggled with the traffic for a few more minutes, I finally asked him to turn round and go back to the hotel. He spoke nervously into his mobile phone, and reluctantly complied. It took me several hours to find out what had actually happened - and to discover I had been on the fringe of an unprecedented demonstration in the Saudi capital. By the time I got to the scene of the protest - an ultra-modern skyscraper known as the Kingdom Centre - it was evening and the crowds had gone, and the building itself stood cool and serene, bathed in ever-changing colours. Only a few police cars remained, keeping a watchful eye on the scene. Eyewitnesses told me what had happened. Hundreds of Saudis had gathered near the Kingdom Centre that afternoon - perhaps as many as 500, they told me, though officials later spoke of half that number. They had called for political reform and the release of political prisoners. There had been men with beards chanting "God is great", a small number of women, and a lot of young people - or "shebab" as they are called in Arabic. Many of them, without doubt, unemployed young men with nothing else to do. One Saudi told me Riyadh had never seen anything like it. The authorities were embarrassed that such a protest could occur in the heart of their capital - on the very day they were hosting the country's first human rights conference. And they were stung by the fact that the call for the demonstration had come from a Saudi dissident in London. I went back to the hotel and filed my piece. But for me at least, the day's drama was not over. Later that night I walked back to the Kingdom Centre and the complex of shops and offices that surrounds it. After a while I found a taxi. Now I know you are always hearing journalists telling you what they have heard from taxi drivers, but this journey was something special. 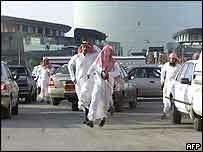 For one thing, it was a Saudi driver rather than the usual Pakistani or Bangladeshi ones you get in Saudi Arabia. Did he know, I wondered, about the demonstration earlier that day? He did, but at first he was reluctant to talk about it. Then, gradually, he began to open up. As we drove past Debenhams, Harvey Nichols, and Marks & Spencers - yes, they really do have branches in Riyadh - my taxi driver scoffed. 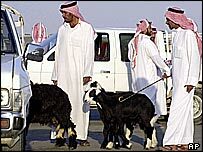 You should see how real Saudis live, he said - and that is what we did. He drove out of the centre of town and showed me the downbeat suburbs where poorer Saudis - many, like him, with large families - live side-by-side with the Filipinos and Pakistanis and Bangladeshis who work in shops and wait at tables and clean the streets. The drab apartment blocks and rubbish-strewn streets were a world away from glitzy, downtown Riyadh. Later that night, on the edge of the city, we passed the sprawling Al-Hamra housing compound, scene of co-ordinated suicide attacks in May which killed 35 people. 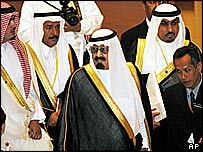 The attacks jolted Saudis into realising that Osama Bin Laden's jihad had arrived in their own front yard. And we passed a big fenced-off compound owned by one of the wealthy princes of the ruling family - the Ali Babas, as the taxi-driver called them sardonically. And I thought back to what I had heard a few days before from a Saudi businessman, a shrewd observer of his country's politics - and of the West. "You Westerners get it wrong," he told me. "You think what's going on here is all about religion and extremism. But that's a problem that can probably be solved. The real issue - he said - was accountability. If the princes responded to pressures for change by democratising, they would end up losing their power and privileges. And that, he said, was why real reform - radical reform - just was not on the cards.